Here's the story. Two brothers who once gleefully shared a bedroom suddenly had a dire need for their own personal space. One a tween and the other not far behind, the boys wanted a place they could call their own. Enter Romeo + Baglio: two Ridgefield designers who have a knack for integrating each client’s personality into design makeovers that can bring positive changes to the way we live. 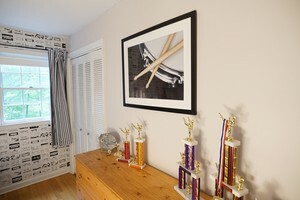 Budding musicians, one a drummer and the other a guitarist, they wanted their rooms to reflect their love of music! “We added acrylic art of their instruments, and other items like a rock n roll clock made from a laser cut, metal in the shape of a record and funky pillows,” says Romeo. For a touch of fun and whimsy, the Romeo + Baglio design team included wallpaper of cassette tapes in one room and an authentic recording studio sign. "This was such a fun project to work on with the creative elements. And to see the boys happy at the end of the project was equally as satisfying!” Romeo remarks. Two bedrooms and two happy boys (and parents). Mission accomplished. Are your kids in need of a bedroom upgrade? Perhaps their rooms are a reflection of days gone by. 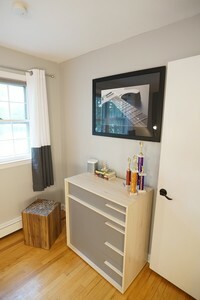 “In this season of giving, surprise your tween or teen with a new improved room they can proudly call their own,” says Romeo. The co-founders of Romeo + Baglio Design are Ridgefield residents, Andrea Romeo and Rebecca Baglio who pride themselves on making the design process simple, stress-free and fun. From full renovations to one-room styling and everything in between, the Romeo + Baglio design team is ready to make your dream a reality. Prior to joining forces, Romeo worked with clients all over the country including major cities like NYC, Boston, Chicago and Austin TX. She studied with the New York Institute of Art and Design and is a Certified Interior Decorator (CID). Baglio was a corporate attorney and has also been an intricate part of numerous real estate development projects overseeing the design process for new construction and remodeled homes.